It is another shade of luxury tandoors for live kitchens and open kitchens . As the name suggests the outer body is of Quality titanium garnished by stainless steel . 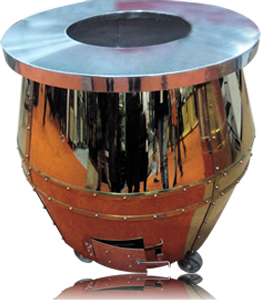 A premium quality clay pot is fitted in titanium barrel along with a provision of ash outlet . The product comes with 4 heavy castors and 4 stainless steel handles for better mobility. The exterior is insulated reinforcely for better durability . These tandoors are major attraction in live kitchen and open kitchen in resorts & hotels. We also provide these as per client's specification. These tandoors are also made LPG operated.